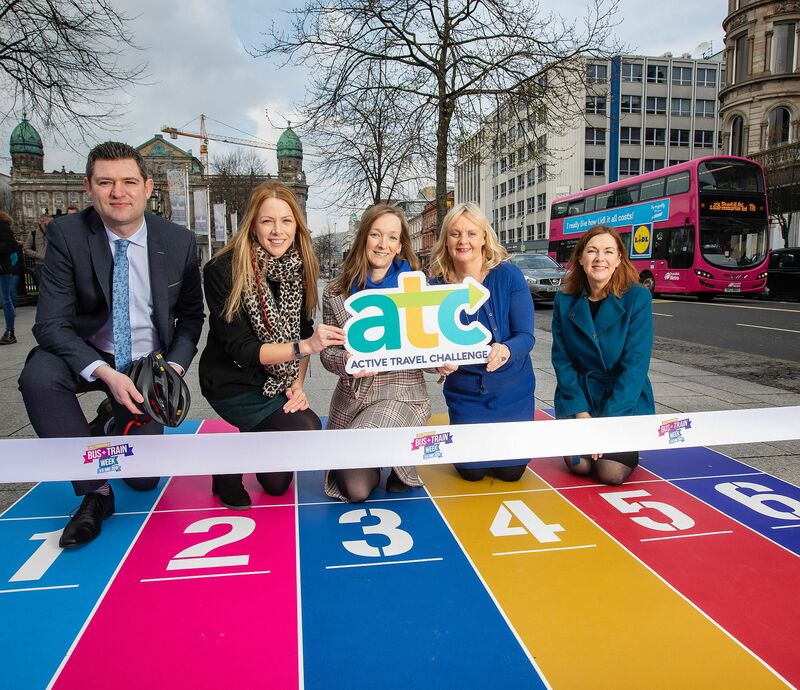 Under starters orders: Chris Morrow, Head of Communications & Policy, Northern Ireland Chamber of Commerce and Industry, Keelin McCone, Programme Manager, Business in the Community, Una Carson, Employee Support Officer, Translink, Clare McKeown, Sustainable Development Team, Belfast City Council and Angela McGowan, Director, CBI Northern Ireland are pictured at the launch of the Active Travel Challenge. The Department for Infrastructure, Public Health Agency, Sustrans and Translink have joined forces to launch the new initiative. Employers from every sector in Northern Ireland are being encouraged to sign-up to the Challenge now, which will see them encourage staff to leave the car at home and walk, cycle or take public transport for journeys to, from and during work in the month of June. Find out more about signing-up to the Active Travel Challenge by visiting https://atc.getmeactive.org.uk/ or email challenge@sustrans.org.uk. Lynda Hurley, Safe and Sustainable Travel Division in the Department for Infrastructure, concluded: “Encouraging people to make sustainable travel choices is a key ambition in the draft Programme for Government and the Department is committed to working collaboratively with others to increase the number of people walking, cycling and using public transport. Find out more about signing-up to the Active Travel Challenge by visiting https://atc.getmeactive.org.uk/ or email challenge@sustrans.org.uk. Keep up-to-date with all the latest ATC action on social media using #GetMeActiveNI.